The New Literacies Alliance is a dynamic curricular project led by librarians from multiple institutions across the United States. Our purpose is to address the new literacies needed for academic success and lifelong learning. In our lessons, students master skills at their own pace using our cutting-edge online learning platform. Since our lessons are free Open Education Resources, you can use and adapt as you see fit. Review some suggested sequences. Read about the different ways to access the lessons and request the links you want. Our hope is to work with other institutions to create a curriculum, built on the ACRL Information Literacy Framework (and related) standards, that helps all students start at the same level for library and research instruction. Discover how you can help support the effort. Want to see what others are saying about us? Our lessons have been written about in the ACRL Instruction Section blog (twice) and the School Library Journal blog. 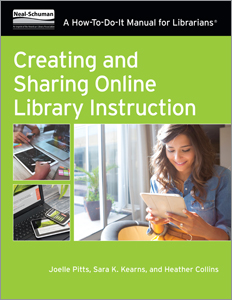 Creating and Sharing Online Library Instruction: A How-To-Do-It Manual For Librarians is out now! Written by three NLA librarians, this text will help groups or individuals who want to collaborate to build learning objects or learn more about resource sharing, instructional design, and library instruction.